Ariel Productions Ltd was a division of Philmar Ltd, the famous maker of jig-saw puzzles, which had been founded by Philip Marx in 1937. 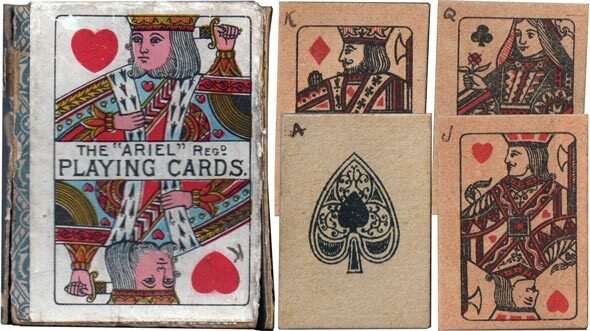 Ariel had been makers of board games for some years before they began to make card games. 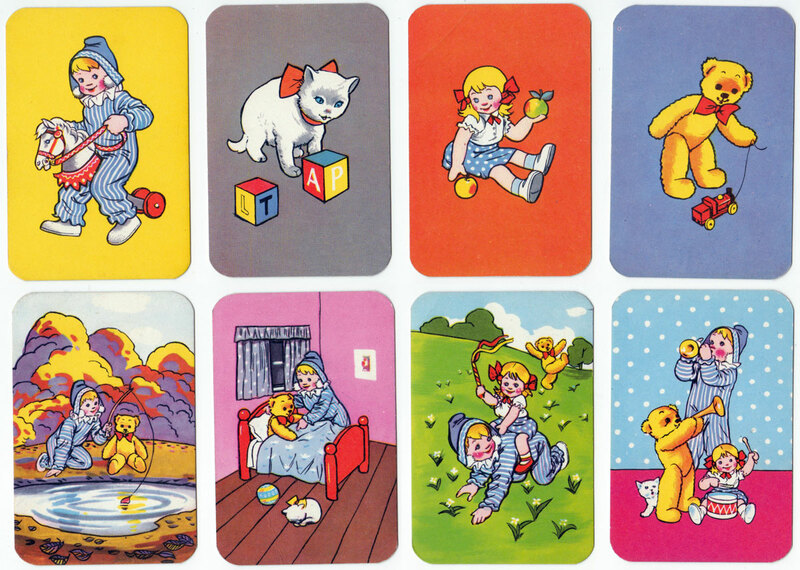 These card games were almost entirely derived from children’s television programmes and were aimed at the cheaper end of the market. The first game, Mr Turnip’s TV Audition Game, was not, I suspect, made in the same place as the rest of the games. It has been die-cut by a proper card process unlike the other subsequent games which were all cut with a guillotine and then cut at the corners with a curved cutter blade. This is a very simple cheap operation which is still used today where small quantities are involved and the expense of a precision forme is not necessary. This cutting method means that whole packs can be cut at once whereas with the use of a forme cards are cut one sheet at a time. The boxes used were laminated with a glossy film like that which used to be used for LP record sleeves. Unfortunately this proved not to be very durable and many boxes are badly damaged today. 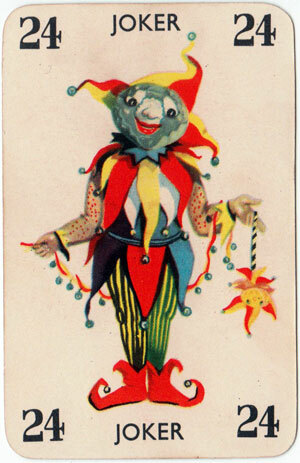 All in all the production seems to have been done “on the cheap” but nonetheless the cards have an undeniable charm and evoke a feel of their period. 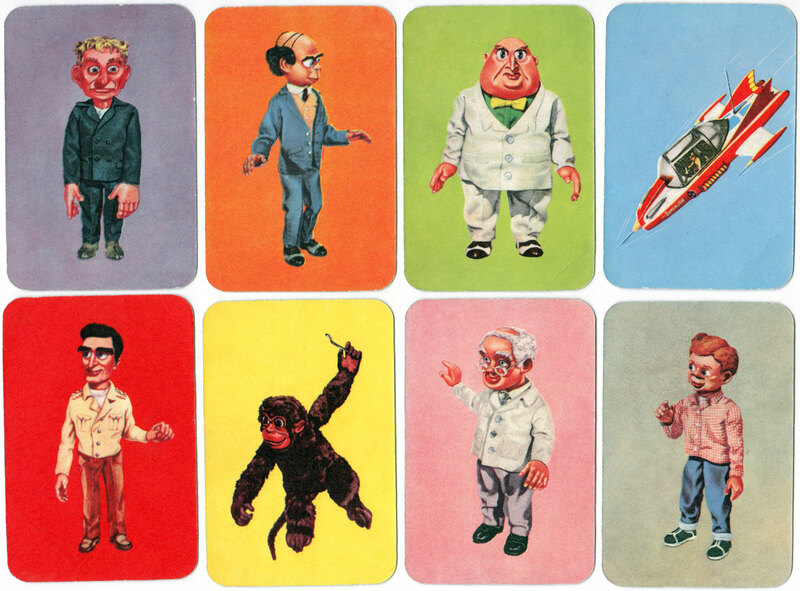 The card games dried up with the Gerry Anderson game Fireball XL5 in 1962 and no more were published as far as I know. After Fireball XL5 the next Gerry Anderson games would logically have been A Stingray game followed by a Thunderbirds game. What a shame…..they would have been great. Ariel board games, however, continued to be made for much longer until Philmar was eventually taken over by Gibsons Games in the 1980s and some of them are still published today. 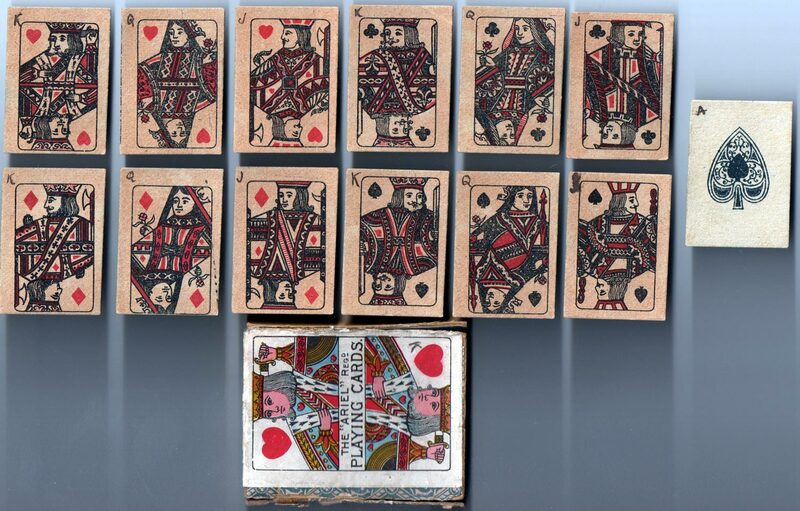 Above: assorted boxes from card games published by Ariel Productions Ltd., 1954-63. All images courtesy Rex Pitts. 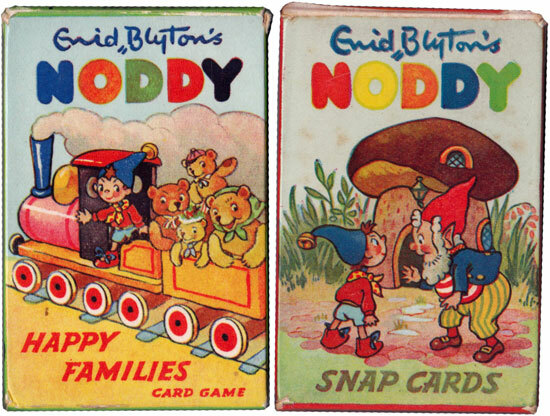 The two games published by Samson Low, Noddy Happy Families and Noddy Snap should be included here, I believe, because Ariel games were also distributed by Samson Low. The Noddy games, which were printed by Purnell the publishers, are packed in a very similar box to the Ariel games with the same laminated film. It is my belief that Purnell also printed the Ariel games for this reason. The founder of Ariel Productions, Philip Marx, was a prolific publisher of children’s books and comics towards the end of and just after the Second World War. During the war there was an acute shortage of paper for printing of non essential items and as the shortage was expected to last for some time after the war ended, a system was devised to allow fair allocation of paper. The answer was to allocate credits for paper according to the number of publications produced by each publisher. This meant that the most prudent and perceptive publisher produced as many different titles as possible to maximise his allocation. The Philip Marx companies published a considerable number of different titles, often printed on the most surprising materials, for example cardboard or even metal foil. One of his companies was Amex and their brand was “Tree Brand”. They published the series of comics entitled “Classics in Pictures” in 1949 and “Flash” comic in 1948-49. Collectors of card games may recognise Tree Brand as the trademark on the well known game “Convoy” which was almost certainly published during the war. Above: Andy Pandy Snap, 1954 (Click image to see more). Andy Pandy was one of the first children’s TV programmes. Made in black and white of course it was first broadcast in 1950. 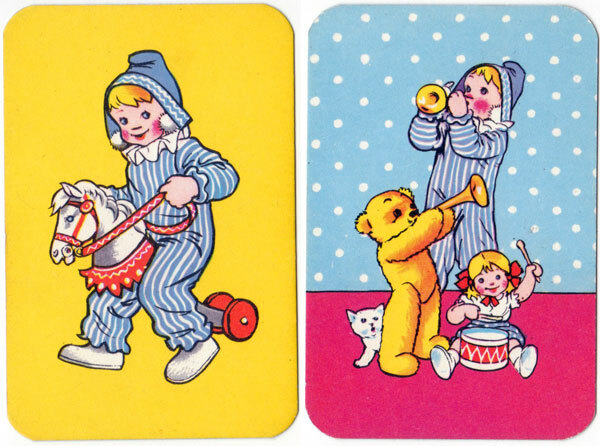 His creators were Freda Lingtrom, who went on to be head of the BBC’s Children’s TV Department, and Maria Bird, who wrote the Andy Pandy stories. Although there were only 39 programmes made, they were shown almost continuously from 1950-1957. Thirteen new programmes were made in colour in 1970 when Andy Pandy had a resurgence of popularity. 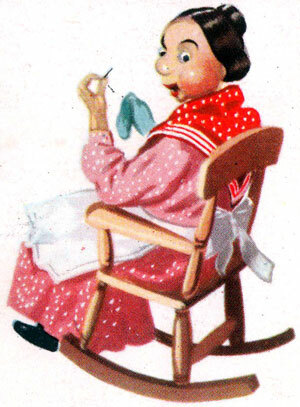 Maria Bird, who also wrote the scripts for The Flowerpot Men, narrated the programs and sang the songs. Everyone remembers “Time to Go Home” at the end of each show. 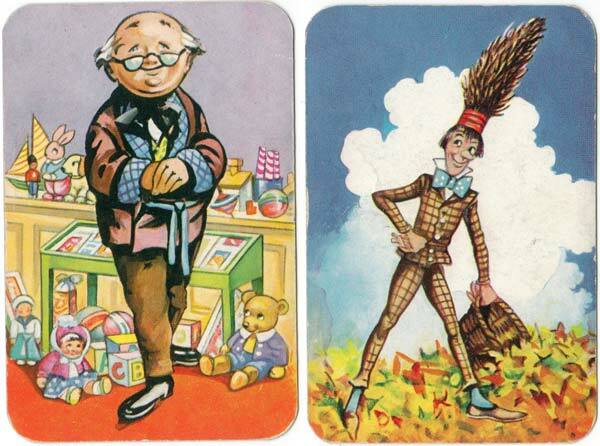 Andy’s companions were Teddy and Looby Loo who didn’t come to life until nobody was looking. The puppeteers were Audrey Atterbury and Molly Gibson. Paul Atterbury, the expert from the Antiques Roadshow, is the son of Audrey Atterbury and he says that his mother told him that he was the model for Andy Pandy when he was a young child. The TV series Fireball XL5 first appeared on our TV screens in 1963. There were 39 episodes in all from AP Films, the Gerry Anderson Company. Gerry himself voiced the character Robert the Robot and his wife Sylvia was Venus. The Fireball XL5 spacecraft was one of a fleet of ships patrolling the Solar System to protect Earth from invaders in the year 2063. It was commanded by Colonel Steve Zodiac whose navigator was the designer of the spacecraft, Professor Matthew Matic. Also aboard were Venus, the French girl friend of Steve Zodiac, Robert the Robot and Venus’s pet lazoon, an extra terrestrial animal. The whole operation was co-ordinated from the base in Space City by Commander Zero and Lieutenant 90. The extra terrestrial “Baddies” were Mr and Mrs Space Spy. Fireball XL5’s nosecone detached to enable a landing party to descend to the surface of a planet, and when there, scooter like jet-mobiles were used to get around. The theme song “Fireball” was sung by Don Spencer and it reached No 32 in the pop charts in 1963. 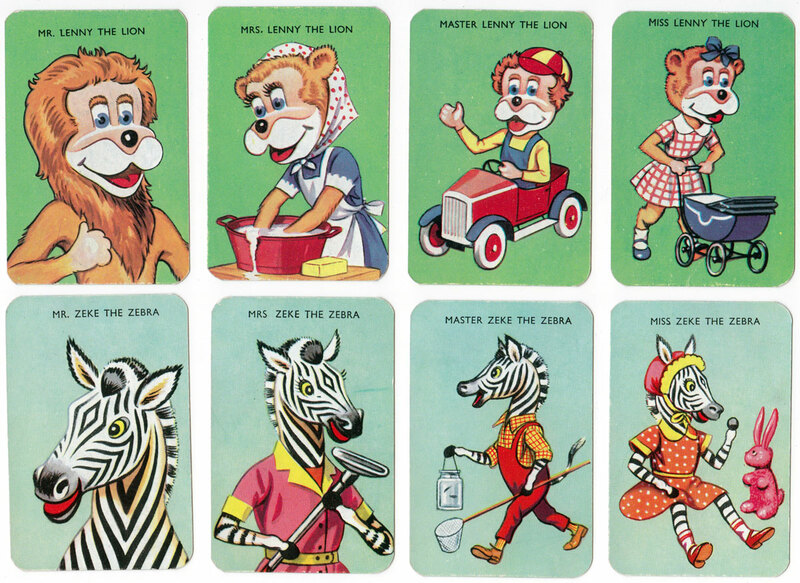 Above: Lenny the Lion's Happy Families, 1960 (Click image to see more). 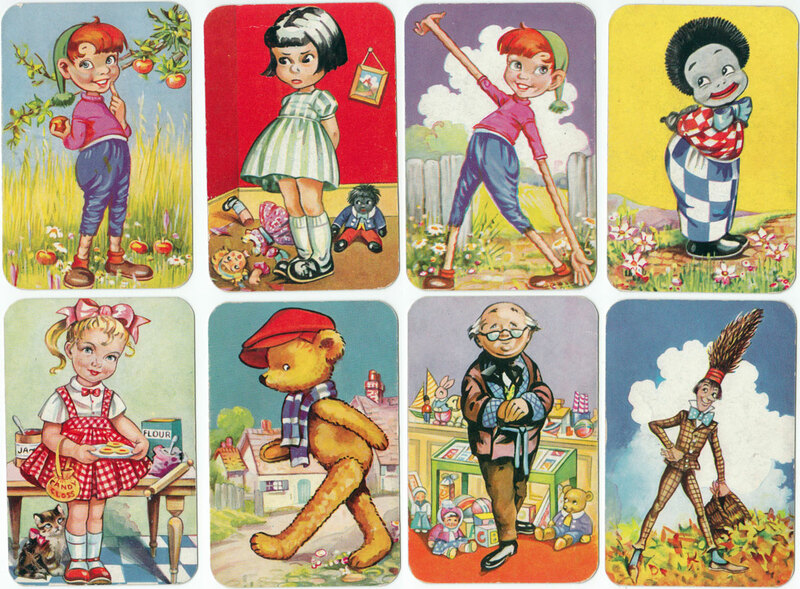 Pinky and Perky’s creators’ were Jan and Vlasta Dalibor, who were Czech immigrants. 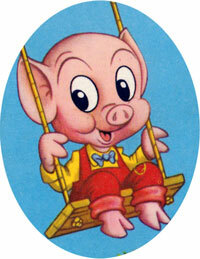 These pig marionettes were a children’s favourite in the late 1950’s and early 1960’s. They were identical except that Pinky wore red and Perky wore blue and usually sported a hat of some kind. They danced and sang to speeded-up songs including versions of pop songs of the day, rather like the Chipmunks from the USA. Their theme son was “We Belong Together”. 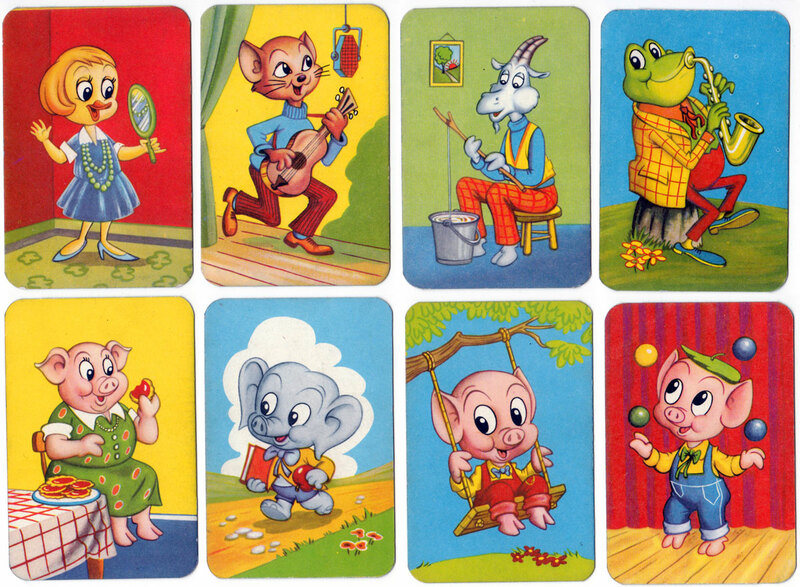 Some of their friends were Horace Hare, Ambrose Cat, Conchita the Cow, Basil Bloodhound, Bertie Bonkers the baby elephant, Morton Frog and Vera Vixen. Their pop group was called “The Beakles”. Several famous personalities appeared regularly with them including Fred Emney and John Slater. 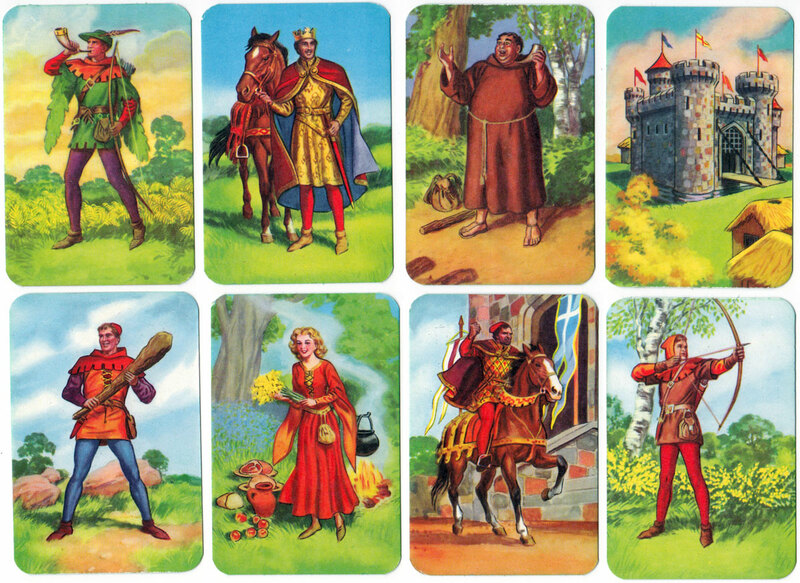 Above: Robin Hood card game, 1955 (Click image to see more). The Adventures of Robin Hood starring Richard Greene was on TV from 1955-59 and is probably the reason for this game to be published. Pepys had already published “Robin Hood” featuring scenes from the TV series and Ariel must have been selling their game in competition at a cheaper price. It probably didn’t sell very well because it’s not a patch on the Pepys game. Harry Corbett bought a little glove puppet in 1946 in Blackpool for 7/6d. He called him “Teddy” and used him in his stage act. The little bear’s first TV appearance was in 1952 on a show called “Talent Night”. Later on Harry though that the little bear wasn’t quite distinctive enough so he rubbed soot on his ears and paws. 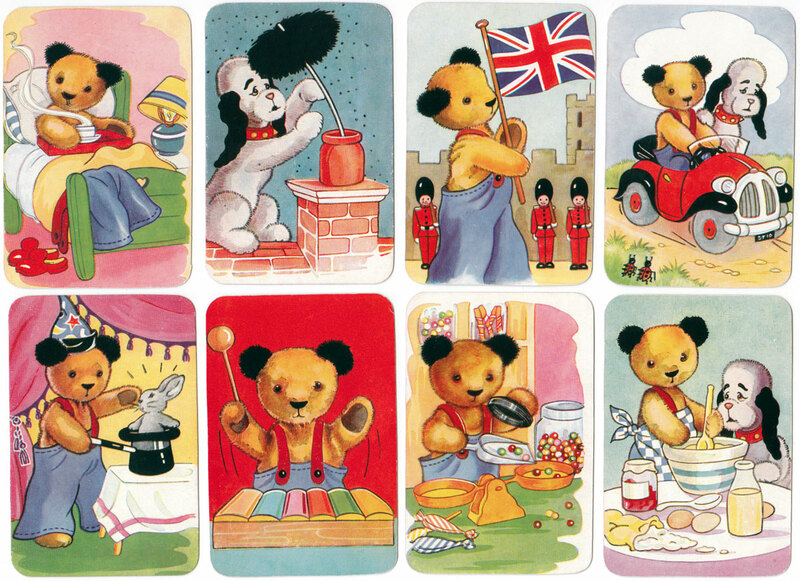 In this way an institution was born; the famous Sooty. 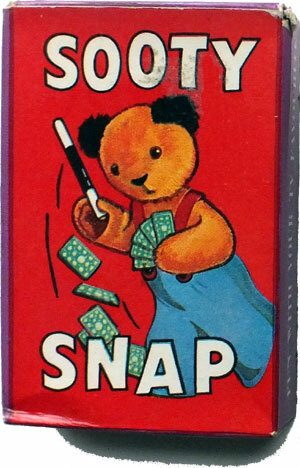 Sweep, Sooty’s less than smart friend, didn’t come into the act until 1957, so any of the games which have Sweep in them must be later than that. Later still other characters were introduced including Kipper the Cat, Butch the Dog, Ramsbottom the Snake and Soo the female panda. Harry Corbett suffered a heart attack in 1976 and his son Matthew took over the act which he later sold on. 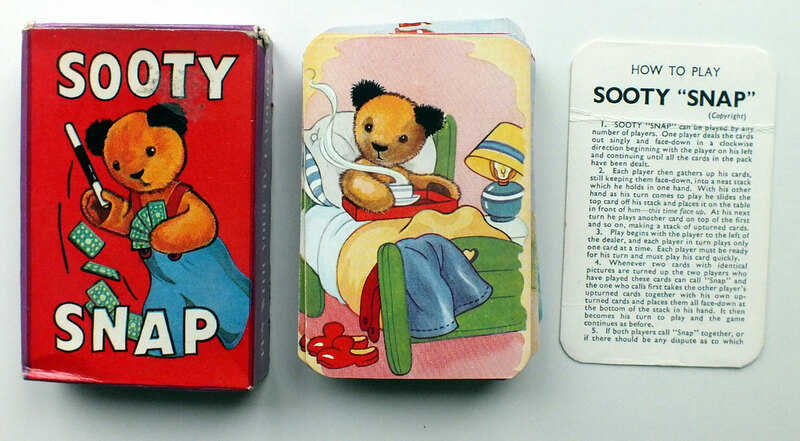 Above: Sooty Snap, 1957 (Click image to see more). Supercar was a vehicle that could travel on land, underwater or in the air and out into space. It operated out of a secret laboratory in the American desert. Mike Mercury was the test pilot who was accompanied by the inventors of Supercar Professor Popkins and his assistant Doctor Beaker. Sometimes they were joined on board by 10 year old Jimmy Gibson, voiced by Sylvia Anderson, with his pet monkey Mitch. Masterspy was the villain who was intent on stealing Supercar for his own evil ends. His sidekick was called Zarin. The series was broadcast in 1961-62 and there were 39 episodes. Above: Twizzle Snap, 1958 (Click image to see more). The Adventures of Twizzle was the first TV programme for children that Gerry Anderson was involved with. He had made some TV advertisements previously with his company Pentagon Films, but this was something new. AP Films was formed with Arthur Povis, Gerry Anderson and Roberta Leigh the novelist, to produce children’s TV programmes and Twizzle was their brainchild. Roberta Leigh, who would later write Torchy the Battery Boy for this company and Space Patrol for its successor, had the idea for the Twizzle stories and approached Anderson to get the project off the ground. Twizzle, whose voice was provided by Denise Bryer, was a special boy with elastic arms and legs who ran away from the toyshop and got himself into all sorts of adventures. Together with his friend Footso the Cat, named because of his large paws, he built Stray Town for all stray toys. Some of his other friends included Chalky, a white faced golliwog, Jiffy the Broomstick Man, Polly Moppet, Candy Floss, a “Mama” doll who had lost her voice and Bouncy a ball which could no longer bounce. All text and images ©Rex Pitts 2014. 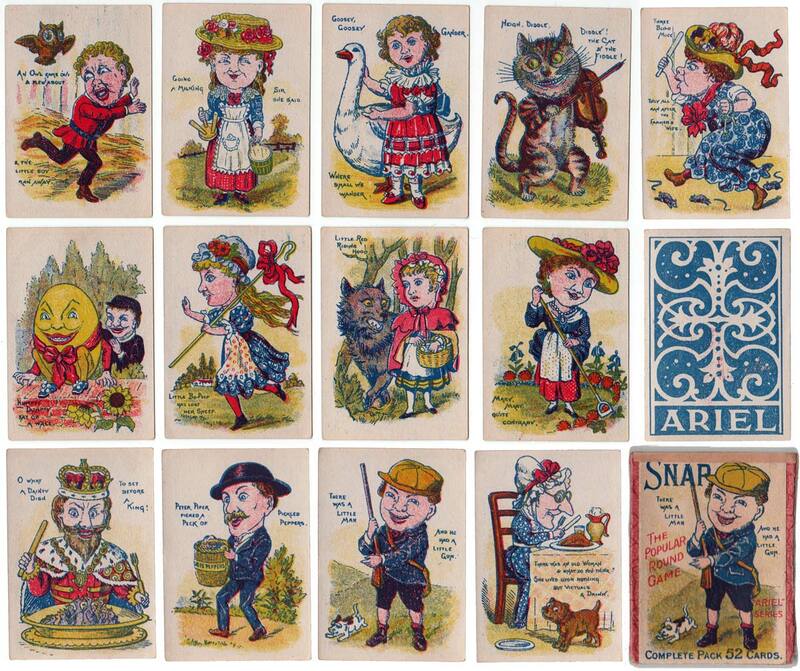 Above: this “Ariel” Series Snap card game based on nursery rhymes is one of several games published c.1900 by an earlier firm with the same name which had been defunct since the 1920s. (Click image to see more). 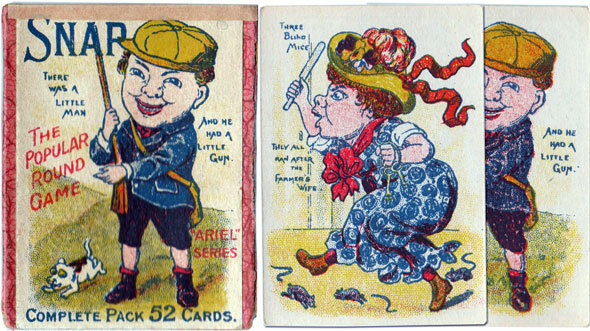 Above: these miniature “Ariel” Playing cards were published c.1900 by an earlier firm with the same name. The indices have been inked in, and the box is a slide-in, like a matchbox. Image courtesy Ken Lodge. (Click image to see more). Above: Treble Chance dice game published by Ariel Productions Ltd, 23-24 Maiden Lane, London WC2. The Treble Chance was introduced into the Football Pools in 1946 so the game is probably early 1950s. Courtesy Marianne Jager.